When it comes to the highest degree of flexibility and skill, Dance with me Toronto is unmatched in the area for private dance lessons in Toronto. You get the advantage with spacious studio operated by Canadian National Professional Ballroom Champion, Egor Belashov. 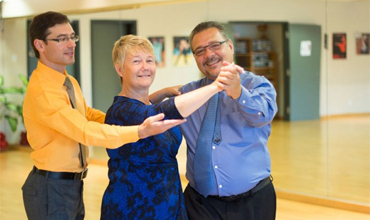 With a custom program and personalized schedule that’s tailored to your needs, goals and pace, we are happy to provide the best dance classes for adults in North York, Markham, Toronto & Scarborough. If you’ve always dreamed of being a dancer, whether skilled in salsa, ballroom or anything in between, we are your go-to dance studio for superior, experienced instruction. Get lessons by the best of the best when you’re at Dance with me Toronto. From Ballroom and Latin private dance lessons Toronto for adults to wedding choreography and club dancing, you know you’re at the right place because our instructors are extremely patient and kind but aren’t afraid to push you to do your best! You will enjoy regular lessons that show you the technical aspect of dancing, along with the best ways to simply let go and have fun. After all, dancing is an enjoyable pastime that makes you feel healthy and energetic. With so many health benefits and fun times, why not start dancing today? We’re happy to help you learn your desired dance, no matter what level you are at, beginner to advanced,for both social and competitive dancing. Here at Dance with me Toronto, we specialize in working with adults between the ages of 18 and 88. Remember: it is never too early or too late to fall in love with dance! We boast an incredible teacher/student ratio of one instructor to one student/couple. This means you get complete one-on-one attention with none of the distractions you would get from a crowded group class. Our private dance lessons Toronto are extremely affordable at $75 (+ tax) a lesson, considering you get individual instruction each and every time. If this sounds like something you’re interested in doing, contact us at Dance with me Toronto today and enroll in Ballroom and Latin dance lessons and classes for adults Toronto. We can’t wait to start working with you!